Mish's Global Economic Trend Analysis: Bank of Japan Adopts Negative Interest Rates: Surprise, Surprise We Lied Again; Meaning of "Now"
Bank of Japan Adopts Negative Interest Rates: Surprise, Surprise We Lied Again; Meaning of "Now"
Eight days ago, the Bank of Japan governor Haruhiko Kuroda, said No Plan to Adopt Negative Rates Now. Well, that was then, and this is now. Today we learn Bank of Japan Adopts Negative Interest Rates. The Bank of Japan has slashed interest rates to minus 0.1 per cent in a shock move that adds a new dimension to its record monetary stimulus. Showing its willingness to expand the policy further, the BoJ said it “will cut the interest rate further into negative territory if judged necessary”. However, the BoJ will use a complicated three-tier system, which makes the negative rate much weaker than comparable moves by the ECB and other European central banks. Crucially, it will only pay negative rates on any new bank reserves resulting from its programme of asset purchases. All existing bank reserves — which amount to about $2.5tn or 50 per cent of gross domestic product — will continue to be paid interest at 0.1 per cent. That means there is unlikely to be any impact on bank profits or bank depositors in the short term. The negative interest rate will only have an impact over time as the BoJ keeps buying assets and creating new bank reserves. The move will add to Mr Kuroda’s reputation for surprises, suddenly adopting policies he has vehemently denied were even possible. Eight days ago he told parliament the BoJ was “not seriously considering” a negative rate. 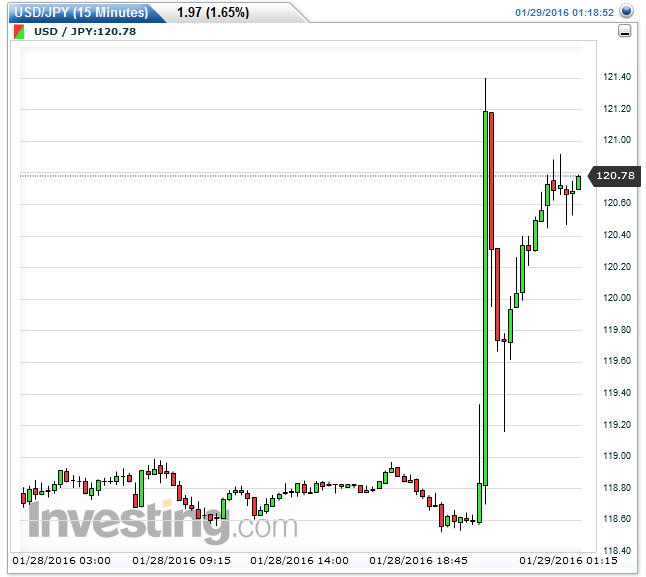 Surprised minds may be interested in how the Yen reacted to this surprise move. 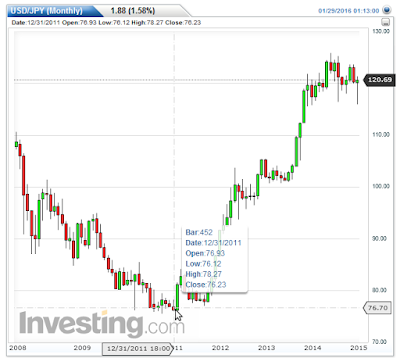 The two consecutive long green candles represents a decline in the Yen vs. the US dollar of about 2.3%. 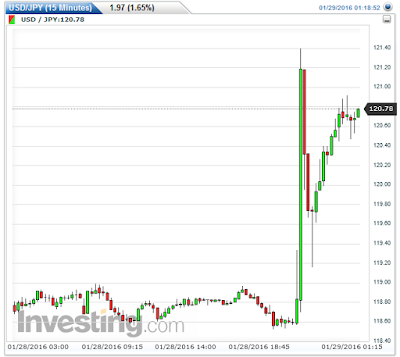 That sounds big but the next chart puts the move in perspective. 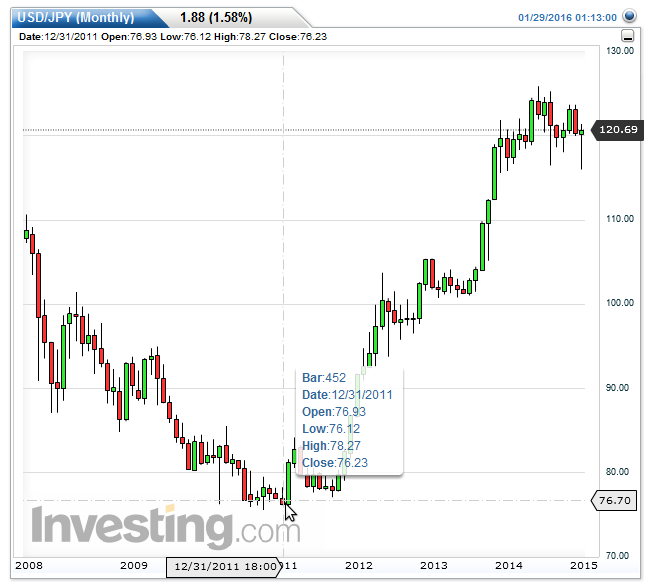 Since January of 2012, the Yen has declined nearly 37% against the US dollar. Yet, Japan is still mired in deflation. If any of these surprises ever accomplished anything, we wouldn't keep having them.